Japanese cooking is a classical art and you need to have all the exact tools for getting it perfect. Equipping your kitchen is the foremost step towards gourmet class cuisines. A Japanese kitchen incorporates multitude of knives and tools that make the recipes distinct and delightful. Primary factor that sets apart traditional knives from Western knives is that they have single beveled edge. One of the popular tools you would find here is the Sushi knife. If you are looking for the best sushi knife, then you must consider its extreme sharpness and hand crafted design. A Sushi knife is a multifarious tool to cut vegetables, fish and the sushi roll. The sharp edged blade is made of high-carbon steel and is vulnerable to rusting. But modern technology has devised many ways to enhance the durability and makes usage easier. 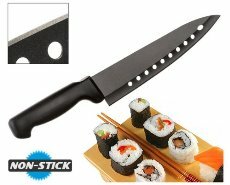 If you are a sushi cook, then this knife is indispensible for your job. While for others, it’s highly recommended to get one if you want to get the professional taste and presentation in your sushi dish. Sushi knives are not on-size-fits-all solution. There are a number of choices and your requirement will determine what variety you pick. Before you plan to buy the best sushi knife for your kitchen, let’s have a snapshot of the varieties available. Yanagiba: This willow shaped knife is the standard sashimi knife ideal for cutting sushi rolls. It glides perfectly with least effort. Deba: It’s more of a meat clever and perfect to cut through bones and cartilage of fish. It is sharper and stiffer. Usuba: Your sushi vegetables can be finely cut and peeled using this knife. It gives you better accuracy and control. Santoku: This is the multi-purpose knife that lets you cut meat, fish and vegetables. Although Western in style yet it is used in many Japanese homes for its versatile usage. The distinct characteristic of a sushi or any Japanese knife is that it is beveled only on the right side. It gives you the edge while you make thin cuts, fine peeling and skillful cutting. The single bevel also makes cutting faster and food is less likely to stick to the other side. Professionals prefer single beveled knives as they offer better precision and are technically comfortable. The only issue here is that it is extremely difficult for left-handed cooks to operate with such knives. Choosing the best sushi knife or any chef’s knife is one of the most important decisions you make towards culinary perfection. Technically, the blade sharpness, shape, handle and material are the generic factors chefs consider while choosing the best sushi knife. Razor sharpness is the peculiar feature of a sushi knife. It lets you peel, cut and slice with utmost precision and ease. Thin blades makes you glide and gives better accuracy in usage. Long blade is what you need if you want to cut across the whole length. It makes your job fast and easy. Narrow Blade is desired as the materials is used in sushi are soft and do not need much force. Tough steel material is recommended to maintain the sharpness and durability of the knife. Which is the Best Sushi Knife for Your Kitchen? Equipping your kitchen platform with the right knife can go a long way in easy and better cooking. The market has numerous alternatives and here we review few of the popular choices. The black and sleek knife has a distinct design and catches the attention of any cook. The non stick coating and integrated holes reduces sticking. It also makes the knife lighter and easy to handle. It lets you effortlessly cut through fish, meat or vegetables. Not just sushi, this knife will be your multi-faceted companion in the kitchen. The ergonomic handle design and sharp blade makes it smooth and seamless to work with. The overall dimension of the knife makes it suitable for versatile usage in the kitchen for everyday cooking. This narrow and long blade knife is ideal for sashimi, seafood and fish. The round wooden handle gives enhanced comfort and control. It is single beveled for right hand use and has a glossy finish. The slender blade lets you slice through fish and seafood in a seamless manner. The razor sharpness and ideal blade dimension makes it perfect for any task. The rust resistant steel blade gives you lasting durability. Overall, it looks fine for chopping, cutting, slicing vegetables and meat. It carries the charm of Japanese style of knife making. Crafted in Japan, this long knife is perfect for slicing fish sashimi. The handle is ergonomically designed and comfortable. The round shaped handle gives good grip. It lets you have better control while slicing and chopping. The Molybdenum rust-resistant blade gives lasting durability along with razor sharpness for better precision. This knife is easy to clean and maintain. The extra long blade makes your job fast and seamless. It can be used for vegetable chopping and slicing as well. In short, it’s a complete package for cutting fish and vegetables. This is a high quality knife which is hand crafted for exceptional performance. It’s the Yanagi sushi knife with Shiroko steel. The Yanagi is the one of the most essential tools in a Japanese kitchen. It’s a high carbon steel that gives you superior sharpness and lasting durability. The superior toughness (Rockwell scale of 62 – 63) of the blade makes it easy for usage. The D-shaped handle is made from Shitan Rosewood which makes is very comfortable. It gives perfect grip and control while slicing. Made with traditional Japanese style, the elegance and quality is praiseworthy. This knife is the perfect pick if you want to create razor thin slices of fish or soft meat. Made from VG-10 super steel, this knife maintains its sharpness for a longer time. The blade is graffiti-etched and adds to the beauty of the knife. The handles are made from premium pakkawood and offer a god grip while using. The blade is single beveled and works well with fish and vegetables. The tapered design makes it smooth to enter the meat slices with accuracy. With great functionality and comfort, it’s a great tool to be in the kitchen. Once you have had an insightful analysis about how to pick the best sushi knife, now you can be more confident in your kitchen. The right equipment with the right technique is the art of great cooking. Be it a professional or home cook, delicious sushi is no more a mystery with an amazing knife.